Rate this project Drew Fahey has announced the release of Helix 2008R1, an Ubuntu-based live CD with a collection of incident response and forensic analysis software: "Helix 2008R1 (2.0) has officially been released and is available for download. This is a major update to the bootable side of Helix, as it is based on Ubuntu rather than KNOPPIX. There are a number of other changes: Guidance Software Linen v6.11.2.2; AFFLIB 3.3.3 - open and extensible file format designed to store disk images and associated metadata; aimage 3.1.0 - advanced disk imaging tool; Autopsy 2.08 - GUI front-end to Sleuth Kit tools; Sleuth Kit 2.52 - open source digital investigation forensic tools; chkrootkit v0.47 - determine whether system is infected with a rootkit; chntpw 0.99.3 - utility to overwrite Windows SAM passwords...." Read the release announcement and changelog for more details. Download (MD5): Helix2008R1.iso (702MB). Helix is a customised distribution based on Ubuntu with excellent hardware detection and many applications dedicated to incident response and forensics. Helix is a KNOPPIX-based live CD with a large collection of tools dedicated to incident response and forensics. Drew Fahey has announced the availability of version 1.9: "Version 1.9 has been officially released. This is not a large update due to work going on for version 2.0 but many of the tools have been updated. NTFS-3g has been update to 1.710, Sleuthkit 2.09, Autopsy 2.08, Scalpel 1.60 to carve data, EnCase Linen 6.01, AFFlib 2.3.0 and libewf-20070512 for image acquisition. The Kernel was also updated to 2.6.18.7. In addition several tools on the Live Windows side have been updated/added: WFT 3.01 and Nigilant32." Read the announcement and changelog for more information. Download: Helix_V1.9-07-13-2007.iso (701 MB, MD5). Helix is a KNOPPIX-based live CD with a large collection of tools dedicated to incident response and forensics. Version 1.8 is out: "Version 1.8 has been officially released. Some of the biggest changes to 1.8 were the code change to mounting journalled file systems - Helix will no longer change the journal mount count when you mount a journalled file system. You also have full write access to NTFS filesystems using ntfs-3g." The new release updates or adds several new tools, including md5deep suite 1.12 ClamAV 0.88.2, Sleuthkit 2.06, Autopsy 2.08, Foremost 1.3, Scalpel 1.54 to carve data, EnCase Linen 5.05f, Adepto 2.0 with AFF support, Endeavour2 file manager, ssdeep 1.0 for fuzzy hashing, AFFlib 1.6.31 for image acquisition. Read the release announcement and changelog for more information. Download: Helix_V1.8-10-05-2006.iso (698MB). An updated release of Helix 1.7, a KNOPPIX-based live CD dedicated to incident response and forensics is available: "A new version of Helix has been released to the mirrors for your testing and use." From the changelog: "Updated 2.6.14 kernel; updated Firefox to 1.5.0.1, dcfldd to 1.3.4, md5deep suite to 1.10, ClamAV to 0.88.1, PyFlag to 0.80, EnCase Linen to 5.04; updated and fixed boot time help code and GRUB options...." Visit the project's home page to read the release announcement and to learn more about the distribution. Download: Helix_V1.7-03-07-2006.iso (696MB, MD5). 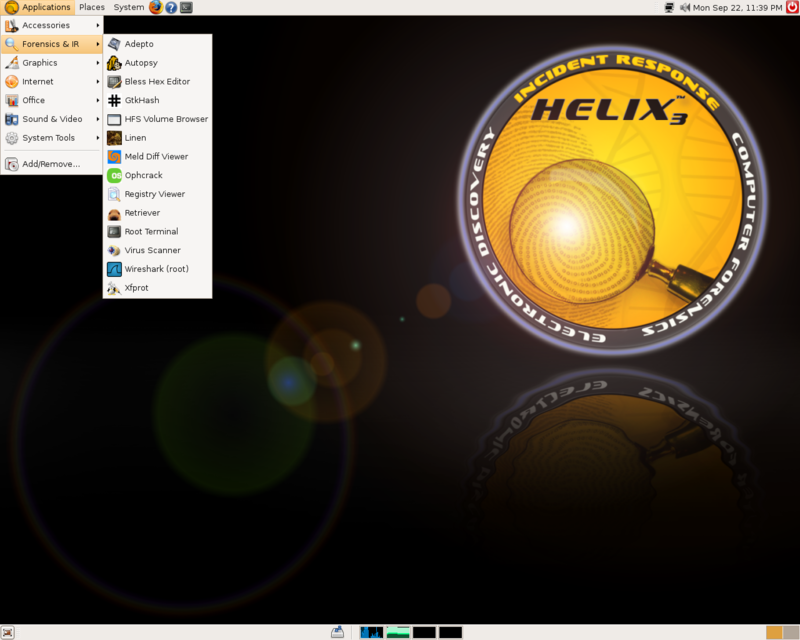 Helix is a customised distribution of the KNOPPIX live CD dedicated to incident response and forensic analysis of compromised computer systems. A new version 1.7 has been released: "Helix 1.7 has been released. This edition revamped the GUI on the Windows side with all new code and added some new tools. The Linux side has been dramatically updated with a brand new 2.6.14 kernel that features many new RAID and SATA drivers." Read the release announcement and changelog for further information. Download the latest Helix release from here: Helix_V1.7-12-07-2005.iso (691MB, MD5). A new version of Helix, a KNOPPIX-based Linux live CD with tools for forensic analysis, is now available: "Helix 1.6 has been released. This edition has many new improvements and updates. Some of the major changes are a complete rebuild of the 2.6.10 kernel that has support for LVM, Cowloop, SquashFS, SATA, etc. Helix now uses Unionfs to create an overlay file system so you can temporarily write to the CD. Helix now exclusively uses the XFce 4.2 window manager. Many new forensic tools have been added to include a few Stego tools. The hardware detection has been greatly improved with this release and should now 'see' most RAID devices/SATA devices, etc. In addition the drivers for the Intel Centrino G cards (IPW2200) have been added." See the full release announcement and changelog for more information. Download: Helix_V1.6-2005-03-07.iso (639MB).